Forty years ago, a teenaged boy named John Lewis stepped off a cotton farm in Alabama and into the epicenter of the struggle for civil rights in America. The ideals of nonviolence which guided that critical time of American history established him as one of the movement's most charismatic and courageous leaders.In "Walking with the Wind", John Lewis recounts his life with the fierce simplicity for which he is known, both in public and private. It began in rural poverty but within the bosom of a loving and resilient family. It has ranged across almost every battlefield in the most dramatic struggles for racial justice -- from Selma to Montgomery to Birmingham and beyond.Lewis's leadership of the Nashville Movement -- a student-led effort to desegregate the city of Nashville using sit-in techniques based on the teachings of Gandhi -- established him as one of the movement's defining figures and set the tone for the major civil rights campaigns of the 1960s, from the Freedom Rides of 1961, during which Lewis was repeatedly brutally beaten and imprisoned; to the 1963 March on Washington, where his fiery speech thrust him into the national spotlight; to his selection as the national chairman of SNCC (the Student Nonviolent Coordinating Committee), which he helped shape and guide; to the 1965 "Bloody Sunday" attack at Selma, where Lewis suffered a fractured skull during a tear gas attack by Alabama state troopers. Lewis, as a participant in the movement, was to be, and remains, utterly true to his boyhood hero, Martin Luther King Jr., as a believer in the philosophy and discipline of nonviolent social action.In 1966, Lewis was ousted as SNCC chairman by Stokely Carmichael, who represented the emerging militant "Black Power" direction of the movement. Two years later, Lewis joined Robert Kennedy in his 1968 campaign for the presidency. He was with Kennedy moments before he was assassinated.Lewis, committed to the principles of nonviolence, spent the next decade organizing and registering four million voters in the South. In 1986, he sought a United States congressional seat in a campaign against his old friend, comrade, and former SNCC colleague Julian Bond. Lewis won the seat in a great upset and serves in Congress to this day.John Lewis tells his story of struggle in the civil rights movement, of comradeship in that community, of its battles and triumphs, and of his own persevering faith with great charm, candor, and humor. "Thrilling. A civil rights hero's fiercely honest look at himself and the nation. Lewis never went for the easy answers, the cliches or with the in-crowd. 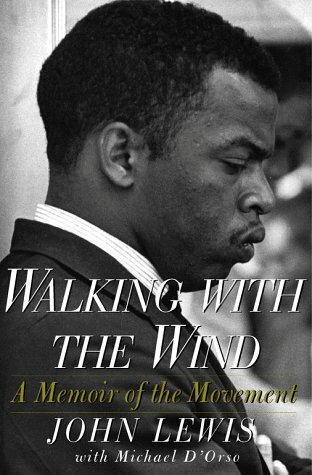 Now he bares his struggles with evil, history and himself in one of the great memoirs of black movement history." The highest black elected official in America, the congressman looks back on his life from his childhood on a Alabama cotton farm to his fight for civil rights, to his enduring commitment to the ideals of Martin Luther King, Jr. 35,000 first printing.